You can buy the Eglu Go with or without a run. If you already have a fenced off area you may not need a run. However, if you are intending to keep your chickens safe when you're not around then a run is a really good option. The Eglu Go has a single large door at the back, which you can open to reveal the roosting bars, nesting area and dropping tray. The chickens perch on the roosting bars at night and their droppings fall through onto the droppings tray. A couple of times a week you slide the tray out and this can then be simply emptied into the compost bin, wiped clean and replaced. Two chickens will provide you with between 10 and 12 eggs a week. They lay these in the integrated nesting area which you can cushion using straw or shredded paper. To collect the eggs you simply open rear hatch and slide the roosting bars towards you. Once you have collected your eggs the rear door can be securely closed by turning the handle. Two strong steel arms securely lock it into place. The Eglu Go has a double walled construction for insulation. 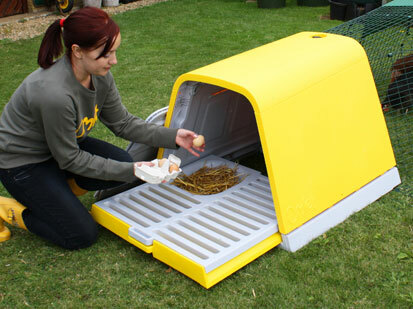 It also has excellent draught free ventilation so your chickens will be warm in the winter and cool in the summer.